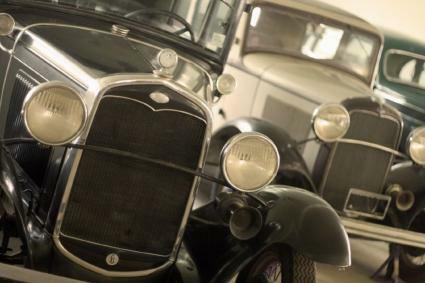 One of the great business success stories, the Ford Motor Company history is an exciting glimpse at the golden age of the American automobile. The auto company was founded by Henry Ford in 1903 and has gone on to become one of the big three United States car manufacturers. In order to fully understand the history of the Ford Motor Company, it's important to know a bit about the founder of the company, Henry Ford. Many people think that Henry Ford invented the automobile, but he is actually considered the inventor of the assembly line. His technique for mass producing automobiles was instrumental in the success of Ford Motors. Born in Michigan in 1863, Henry Ford grew up on a farm and then quickly moved his way up in the Edison Illuminating Company, where he met his future friend and mentor, Thomas Edison. It was with Edison's support that Ford designed a self-propelled vehicle, which he named the Ford Quadricycle. After a few moderately successful automotive ventures, Ford partnered with several other Michigan businessmen to create the Ford Motor Company. A new car was designed for the company, and Henry Ford made headlines by using the car to set a new land speed record of 91.3 miles per hour. The publicity from this event and the subsequent touring of the vehicle helped provide some of the momentum for the company's early success. Notable early Ford cars included the Model A, Model C, Model K, and Model T. When these early vehicles were produced, two or three workers created each vehicle by hand. Only a few cars could be produced each day. In order to decrease the cost of the vehicles and increase the production, Ford created the assembly line. By 1913, Ford Motor Company was having a difficult time keeping up with the demand for the Model T. When Ford introduced the moving assembly line that year, it allowed the company to produce many more vehicles at an affordable price. Rather than having several workers devoted to the production of an individual car, the cars were produced by an entire line of workers using pre-made components. The system worked. By 1920, Ford was producing over a million vehicles a year.The assembly line dramatically changed automobile production. Other companies were forced to adopt the practice or were unable to compete. Ford became a power player in the world of automobile production. In 1919, Henry Ford turned over management of the company to his son, Edsel Ford. Focusing on keeping prices low and production high, the company neglected to adopt new car technologies and fresh designs. Increasing market share went to General Motors and Chrysler, who were continually coming out with new models at a variety of price points. Most of Ford's business had come from the Model T, but the company needed to diversify in order to compete with other automakers. The Model T was retired in 1927. 15 million Model T vehicles had been produced. The 1930s were extremely difficult for American companies, and Ford was one of the many companies forced to lay off workers during the Great Depression. There was little assistance available for these workers, and unemployment in Detroit reached 30%. Henry Ford made speeches denouncing unemployed workers for not doing more to recover from the job losses. Angered by the speeches and frustrated by the loss of their jobs, the workers demonstrated at Ford's River Rouge plant in Detroit in 1932. The demonstration turned violent, and five men died when they were shot by police and plant security guards. World War II helped the American economy recover from the Great Depression. As a pacifist, Henry Ford did not immediately want to profit from World War II. However, when the Nazis took over control of Ford's German factories, he sprang into action. He used the assembly line to create products for the war effort, including Jeeps, B-24 Liberator planes, and aircraft parts. Edsel Ford died in 1943, and Henry Ford resumed day-to-day control of the company. He continued to manage operations through the rest of World War II and then turned control over to his grandson Henry Ford II in 1945. In the decades after World War II, Ford Motor Company went on to become a publicly traded company and one of the most successful automobile companies of all time. Models like the Thunderbird, the Falcon, and the Mustang cemented Ford Motor Company's role in American popular culture. In 2006, Ford mortgaged many of its assets to finance a full redesign of the company. The company's restructuring is expected to continue for several years, and Ford hopes that the changes will help it remain competitive in the world automotive market. If the Ford Motor Company history is any indication, the company will survive to produce many more iconic American vehicles.